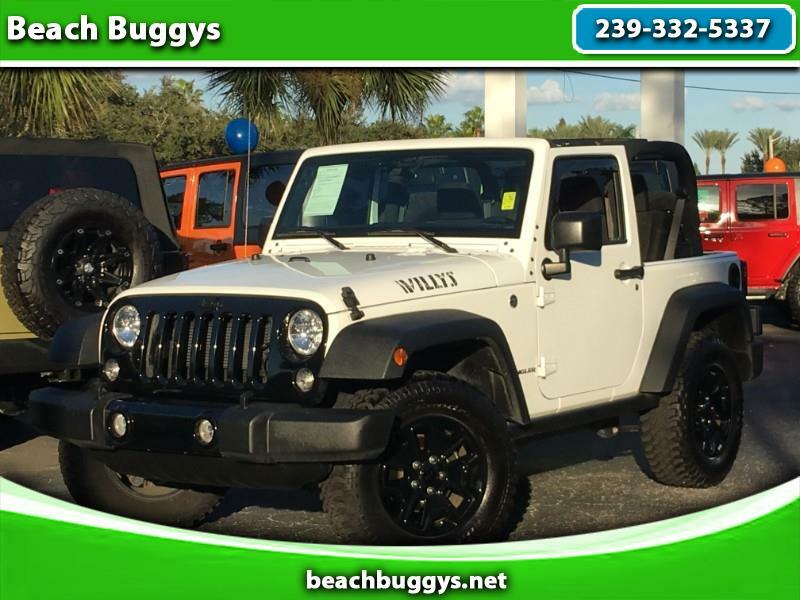 This 2017 Jeep Wrangler Willys Wheeler Edition is a ONE OWNER FLORIDA VEHICLE, WITH REMAINING BUMPER TO BUMPER WARRANTY AND POWERTRAIN WARRANTY. It comes equipped with Tinted Sun Rider Soft Top, Electronic Stability Control, Hill Start Assist, Trailer Sway Damping, 4-Wheel Disc Brakes, Low Back Bucket Seats, , Next Gen. Dana 30 Solid Front Axle, Next Gen. Dana 44 HD Rear Axle , Steering Wheel Mounted Audio Ctrls , Full Size Spare Tire , Fuel Tank Skid Plate Shield , Transfer Case Skid Plate Shield , Hill Descent Control , Traction Control , Willys Wheeler Package , Electronic Roll Mitigation , Hydraulic Assist Brake Booster , 3.73 Rear Axle Ratio , Anti-Spin Differential Rear Axle , 3.6L V6 24V VVT Engine , Chrome/Leather Wrapped Shift Knob , Rock Rails , Air Conditioning , SIRIUS Satellite Radio , Uconnect Voice Command w/Bluetooth , Audio Jack Input for Mobile Devices , Remote USB Port , Leather Wrapped Steering Wheel , Willys Hood Decal , LT255/75R17C BSW Off Road Tires , BF Goodrich Brand Tires , Performance Suspension. This is a Clean CarFax Florida Jeep with Factory Remaining Warranty! Contact our experienced sales staff today for more info.